The FBI reports that scams where criminals pretend they are a friend of yours who has been harmed in some way and who is in urgent need of financial assistance are on the rise. These “I need help” scams work by hijacking email, social networking accounts, or anywhere messages can be sent to access the user’s friends lists to set up social engineering scams that swindle the ‘victims’ friends and family out of thousands of dollars. The criminal pretends to be the account owner (your friend, family member, associate) and spins a heartrending tale they send to you in email/on Facebook/etc… about how they were robbed or encountered some other crisis (typically while traveling abroad) that left them without funds, in a hospital, in need of cash to pay their hotel bill, etc. Usually the story includes that the ‘victim’ has lost their wallet, credit cards, passport money and cell phone in the robbery. The need for funds is urgent, and of course the ‘victim’ will repay you upon their return home. The scam often includes a ‘Good Samaritan’ helping your poor friend, so that you willingly transfer money to the scammer’s name – while they claim they will then bring the money to your incapacitated friend (in some cases the scam may be worked by phone, where the Samaritan calls on the ‘victim’s behalf). Alternatively, the scammer will simply use fake ID claiming to be your friend so they can pick up the funds, or have an accomplice in the Western Union (or other wire transfer service) that will hand them the funds. Any time you receive a communication with a tale of woe and request for help, slow down. Verify the information before sending any money. Call their phone number(s) to see if your friend is indeed traveling – most likely they aren’t. Ask yourself whether this person would be likely to turn to you for help, or whether they would turn to someone else. Look up the phone numbers for the hospital, hotel, etc. to verify the incident (Do not use phone numbers that are included in the email, or told to you by ‘the Samaritan’ these are likely to be the scammer’s numbers). Taking 15 minutes, or even a couple of hours, to check the facts is your best defense against the “I need help” scams. If you have fallen victim of this type of scam, or to report any cybercrime, you can contact the www.IC3.gov website so they can input the information into their complaint database and find links to other complaints for potential referral to the appropriate law enforcement agency. 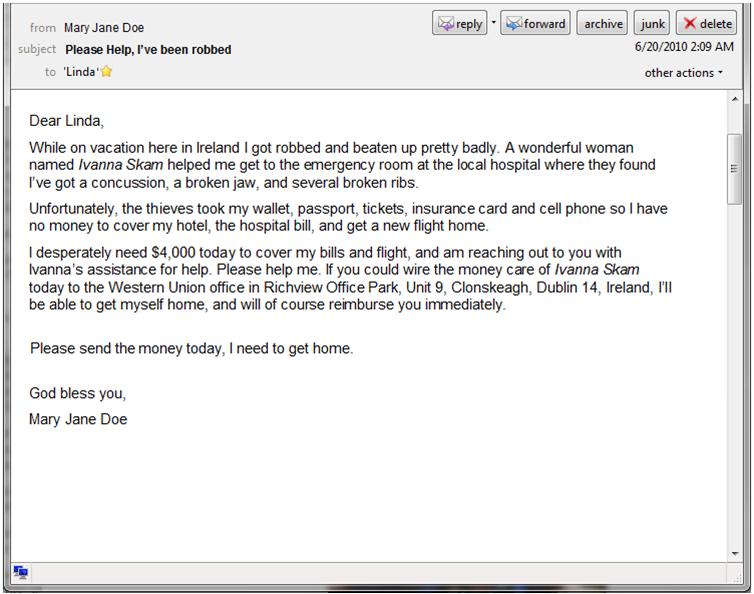 To learn more about scams, consider practicing on some more of our spam scam examples. This entry was posted on Monday, July 5th, 2010 at 7:22 am and is filed under Linda's Blog. You can follow any responses to this entry through the RSS 2.0 feed. Both comments and pings are currently closed.